For a while now, I’ve wanted to write an entry about promotional recordings– basically, some helpful hints for artists who are considering mailing a copy of their latest album to their favorite radio stations. To begin with, let me say that these are my observations on this topic. I don’t represent other DJs or radio stations, and I won’t claim that I know what they think. I do know that I’ve been on the receiving end of many, many promotional packages– and that every artist and label is hoping their package will catch the eyes and ears of a friendly DJ. The first thing to remember is that most of the time, your package is being opened by a human being. Don’t expect us to know every album that is released. If your album doesn’t clearly state basic information such as the artist or band name, album title, label, and contact info; then consider clarifying this information with a short letter. Your all-black album cover may be super-cool to you, but it doesn’t help a DJ tell your future audience anything about you. You can keep your album cover the way you like it if you present this information in a clearly written letter or press release. Speaking of press releases… In my opinion, they’re generally full of nonsense. I’d be a rich man if I had a dime for every press release that tried to describe an album via the old “sounds like X on drugs!” Sometimes this works, but usually, it doesn’t. Personally, I’d prefer the basic information listed above. Additionally; a discography, personnel list, and a short biography are nice. Although you may think a cutesy biography about how your band members are from outer space is great, take a breath and remind yourself that you are not Sun Ra. Unless you want to be remembered more for your ability to write goofy stories about how you met your bassist than for your music, keep your high-school yearbook patter to a minimum. If you are not applying for a job, I don’t give a damn if your press release is in a special folder, or printed on expensive paper. Most likely, I will only be keeping it long enough to memorize or clarify important details, and then its off to the recycling bin. Your folder will end up being used for my daughter’s homework– a nice gesture, but hardly worth your money. Like you, I appreciate the human connection– and I am truly thankful for every person and label that believes enough in what I do to entrust me with their music. However, there are still a few things you can do to help things along. Two areas that perpetually concern submitting artists involve audio format, and album packaging. Let’s examine these! As far as packaging goes, I fully recognize and understand that you may not want to give away promotional copies of your hand-quilted angora-knit album cozy when mailing it to me. These are special items for collectors, and really have no business going to DJs unless you’re just trying to butter them up. Don’t get me wrong– I’ll gladly accept your limited-edition knit cozy with glee, but my radio audience is going to have a difficult time seeing it. This doesn’t mean I want you to send me your disc in an old sock, either. Choosing some sort of durable case that I can carry to and from the radio station in an overfilled bag is the best idea. Unlike a collector’s albums posed prettily on a shelf, my albums have to move back and forth and get a bit of a workout. This is especially true if I really like your stuff, because I’m going to be carrying it around a lot. Heavy paper sleeves, jewel cases, maxi-cases, etc., are all good choices. Simple paper sleeves or a disc loose in an envelope are broken and lost discs waiting to happen. I will do my best to find a case, and to safeguard your work, but its a great idea to excercise a bit of prevention. Finally, don’t overlook simple things like writing on the spine of a case. 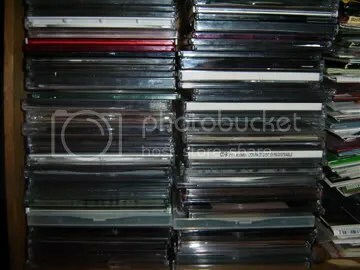 If you’ll take a look at the pictures below, you can see how many of my albums are stored. Although I know my collection very well, it is far easier for me to find your album amongst the labeled discs than among the unlabeled, which begin to look alike. Although I will never hold something like this against you or your music (which is truly all that matters to me) you can easily imagine that I am more likely to grab a disc whose name I see readily, rather than one whose name I don’t. Plus, seeing the name on your disc often will help me remember it. As a last note on packaging, the photo below shows some easily correctable problems. First, there are no track times. This is simple enough to write in, and helpful. Secondly, there is no way of telling if this is a copy of an album released by this artist or a selection of tracks assembled specifically for a DJ. Finally, there is an obvious misspelling. I know this probably sounds picky. I’m only mentioning it because, for a submission like this one, it’s the only thing I really have to distinguish your material from that of others. Regarding audio formats, I can honestly say that I’m totally flexible. Obviously, a regular audio disc is easiest to work with– be it professionally created or burned at home. Please take a moment to check that the disc plays in your stereo before mailing it. Burners are flighty creatures prone to error, so taking a moment to check out your disc is helpful. I also don’t mind mp3 files on a data disc. These can often save you some appreciable money on postage, and allow you to send more materials. Most radio stations can play your mp3 as easily as an audio disc, but again, take the time to check the verity of the disc itself. 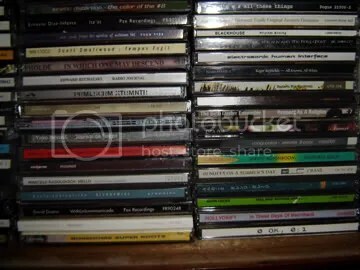 Labeling the files neatly is also a plus– in my experience, the cd players we use to broadcast mp3s are difficult to use without being able to see a meaningful file name. The greater the sound quality of your file, the better– but I will gladly air poorly recorded material I enjoy over professionally-formatted crap. Finally, sending cassette tapes and vinyl is still totally cool. Don’t feel left out if you’re not able to send something digital! When this poor package arrived, it was short three cassette tapes, and two cds. The lovely United States Post Office employees responsible ripped the package in three completely different ways, stuck one disc back in without a case, and slapped a “we’re sorry” sticker on it. Then they dumped everything in a big plastic bag, and dropped it off for me. Nice, eh? I’ve also had packages arrive bearing large labels indicating they were searched by the morons at the Department of Homeland Security. Instead of saving lives in New Orleans, they are more interested in the music you mail to radio stations, so please be careful. Oh! One more thing: if you’re seriously broke, or if mailing something is going to result in your imprisonment by a fascist government, I’ll download your mp3 files if you send me a link. But never ever send me mp3 in an e-mail. It’s rude, and I delete them. Gee, this entry turned out to be much longer than I would have guessed. I hope I didn’t make anyone angry. I am only trying to share what I hope is helpful, useful information. Again, I appreciate everything that anyone has ever sent in– as well as those that have simply contacted me to say “thanks” or “hi” or whatever. This entry was posted on December 10, 2006 at 2:57 am and is filed under Call for Submissions, experimental music, Radio. You can follow any responses to this entry through the RSS 2.0 feed. You can leave a response, or trackback from your own site. hey there. thanks for a useful article. i work for lovely music and send you cds occasionally. i also am a mover/shaker for anti-social music (i think we sent you a promo copy, but let me know if we didn’t…). anyway, i like your new blog. oh, and joan la barbara really appreciated the review. cheers… andrea. that was a great read dave. thanks for the tips. they make loads of sense. Why is Bitrate posted as in compiliation “Untitled” when it is in fact not?????????????????????? Thanks for letting me know what it is like at the other end, Dave, having sent out almost 600 home made DIY cds over the last 2 years. Wish more djs were this considerate.